When your computer dies, make more dessert! I did not intend to write about yet another dessert, but due to a motherboard failure, my computer is imprisoned at a local repair shop waiting for warranty parts to arrive. So are all the food photos I finally downloaded from my phone. Chilled Pasta Primavera and Saged Chicken Stuffed with Sautéed Kale, Bacon, Caramelized Onions, and Goat Cheese will have to wait. Luckily, I recently inherited my husband’s old laptop. I also have an insatiable sweet tooth and will gladly suffer through a spontaneous batch of Rosemary Shortbread for the sake of this blog. No kicking. No screaming. It actually works out quite well – these cookies are light and a tad savory, are complimented by a glass of hearty red wine, and will be the perfect contribution to the barbecue we’re attending tomorrow. 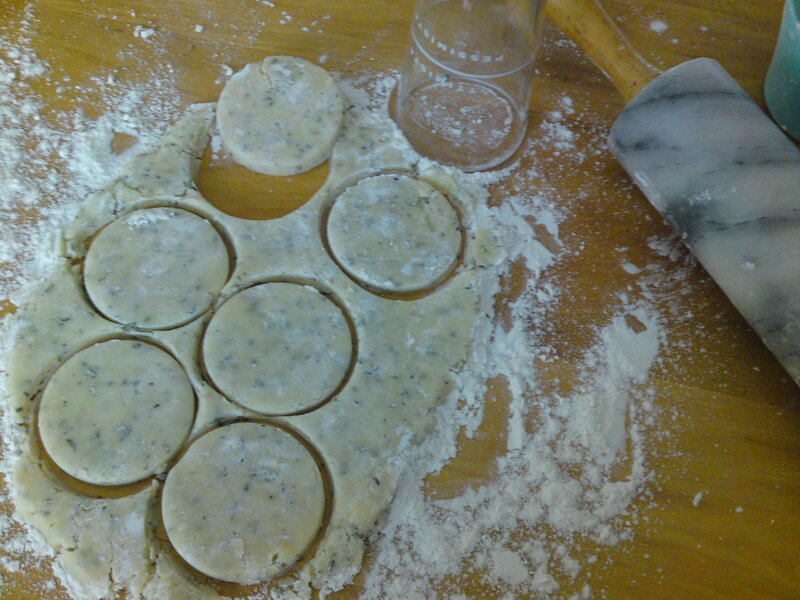 I was introduced to Rosemary Shortbread by Ruby, Eugene’s bottle-cap artist extraordinaire. True to my tendencies, I tweaked the recipe to fit my taste. With this one, it was the simple addition of salt, which I think enhances the flavor of both the rosemary and the butter. Try it both ways if you’re inclined – figure out which suits your fancy. 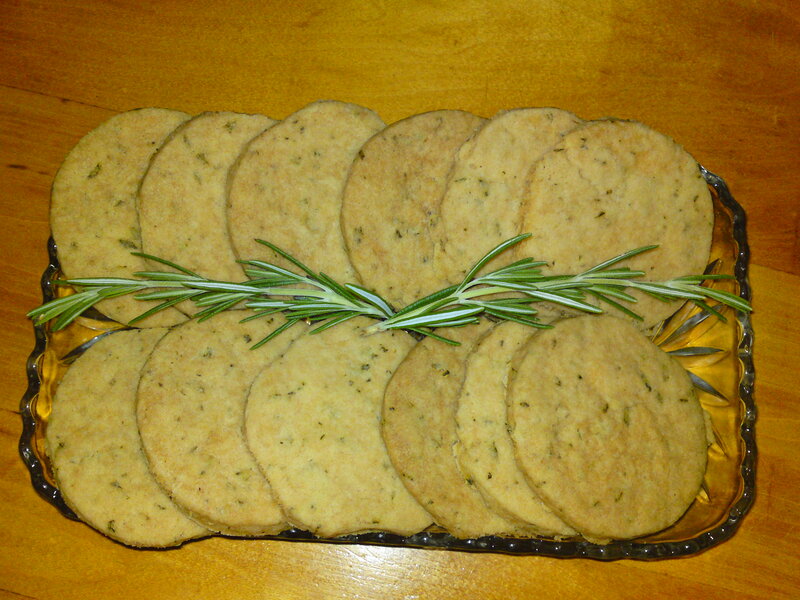 If at all possible, harvest the rosemary just before making these cookies, and use only the soft tips of each branch. This time of year, that means 2-3 inch fronds on my plant, and it takes close to 20 to make 4 finely-chopped tablespoons. Don’t have your own rosemary bush? Perhaps a neighbor or a friend does. They’ll likely trade all the rosemary you want for a plate of these gems. Sift sugar, salt and 2 ½ cups of the flour into a mixing bowl. 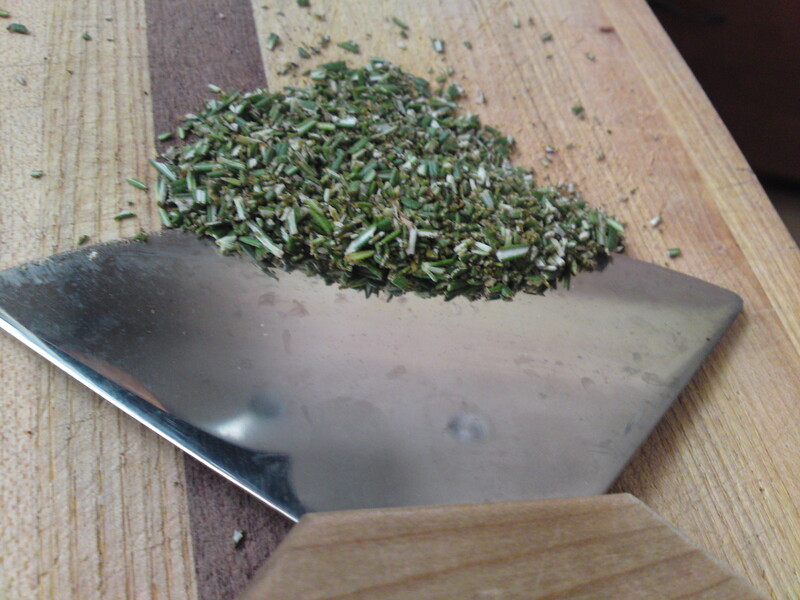 Add the finely chopped rosemary. Cut the chilled butter into cubes and blend with a pastry blender or two forks. 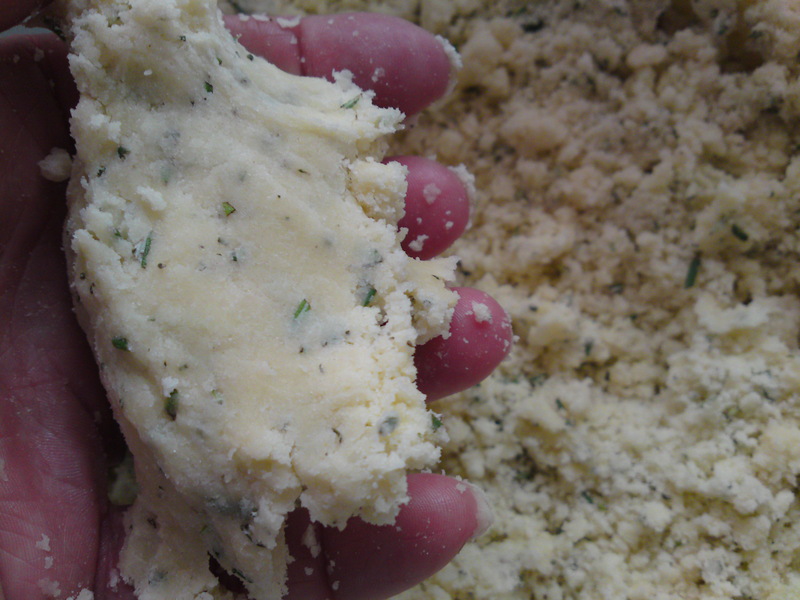 The point is to cut as much of the butter into your dry ingredients before using your hands, which will warm the dough. Then use your hands to gently work the butter in until the dough resembles coarse meal. Once mixed, it should clump in your fist but easily break apart. Preheat your oven to 300 degrees and have an ungreased cookie sheet ready. Dust your work surface with a few tablespoons of the remaining flour. Form ¼ or so of the dough into a firm ball and press into the work surface. Sprinkle flour on as needed, making sure you keep a layer of flour under your dough or you’ll be scraping up cookies with a spatula. Now you need to get the dough to about ¼” to 3/8” thick. This dough would much rather break into a hundred pieces, so I use the heel of one hand to flatten it while using the fingers of the other to keep if from breaking apart. Once flattened, finish it off with a rolling pin. Flour a cookie cutter or the lip of a small glass, cut as many cookies as you can, and place on an ungreased cookie sheet. 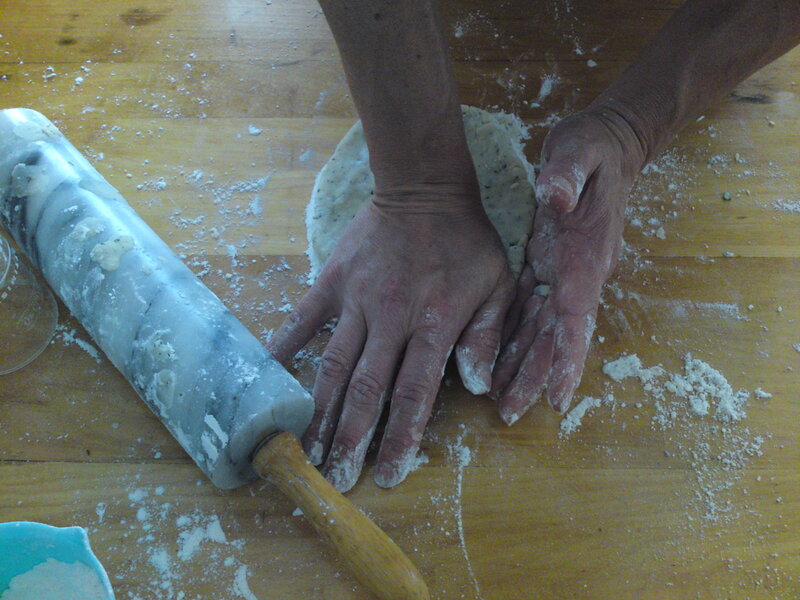 Add the scraps left on your work surface to another batch of fresh dough and repeat the process. Makes approximately 3 dozen 2″ cookies. Kitchen Tip: My husband and I can polish off an entire batch of these in a couple of days. If I’m not making them to share, I force myself to freeze a cookie sheet of unbaked cookies, pack them in a Ziplock once they’re frozen hard. When it’s time for fresh-baked cookies, I put them back on a cookie sheet, defrost at room temperature for a couple of hours, and bake as usual. As I mentioned earlier in the post, they go very well with red wine and make a nice finish to a hearty Italian meal. Friends of ours who generally don’t like dessert love these cookies. Enjoy, and, as always, I’d love to hear how they turn out. our preferences were nearly unanimous. Sweetened Rosemary was the favorite with the Rosemary Goat a close second. 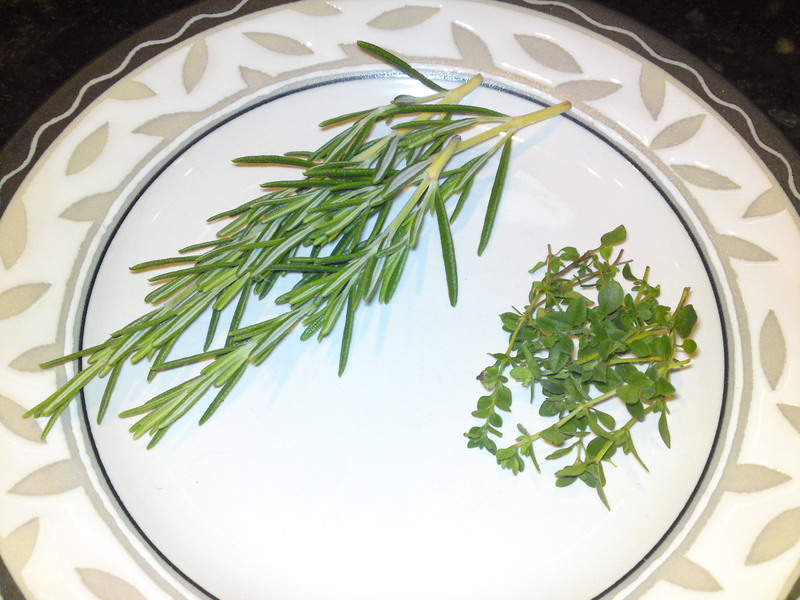 Even though I left the thyme infusing for twice as long as the rosemary, no one could pinpoint what flavor it was, and no one really liked it. (Stefano spit it directly into the trash.) 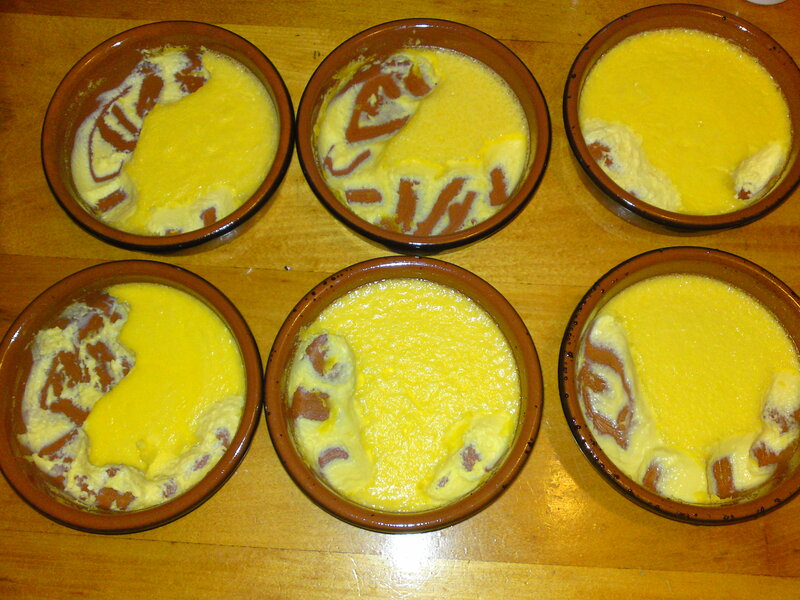 Dividing thickened eggs into 6 exact fraction-of-tablespoons portions is not so easy, and my proportions were not 100% accurate, making some taste a little eggier then others. Nonetheless, the Sweetened Rosemary Brulee was the hands-down favorite for dessert and the Rosemary Goat Cheese Brulee seemed like it would work well either as an appetizer or in place of a cheese course at the end of a meal, perhaps with apples or crisp pears… More experimentation is in order, and I hope to share the recipe with you soon.